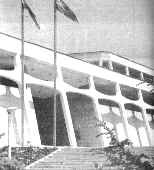 In 1976, it was suggested that an Iranian carpet museum be founded. Therefore some of the qualified experts on carpet set off on a trip to several cities and countries to collect different kinds of valuable carpets. After a while some carpets were collected. This procedure assumed even greater importance after 1979. Now there are many valuable carpets on display in Iran Carpet Museum to preserve the cultural heritage of Iran. Building of the museum with beautiful architecture and white ornaments, which associate it with a carpet loom, is located on a beautiful scene beside Park of Laleh. The exhibition hall of museum covers 3400 square meters (~10200 square feet), containing two halls used to display different kinds of kilims and handmade rugs. The ground floor hall is devoted fairs and the one upstairs to temporary exhibition of kilim and rugs. One of the oldest and most important carpets, available in this museum, is a carpet belonging to safavid era, called "Sangeshku". There are also seven animal carpets, "Sheikh Safieddin Ardebili" carpet, garden carpets and tapis Polonaise or Polish carpets, which are some of the precious carpets available in this museum. Carpet, known as Polish carpet was made in Isfahan, 17th century, to fill the order of a Polish Prince. This carpet was transferred to Poland at the time. Materials of these carpets are silk fibers, as well as natural dyes woven together with gold and silver threads. 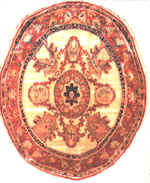 As many as 300 carpets of this kind had been Identified throughout the world, so far of which seven carpets have been brought and returned to Iran. There is an exhibition hall in museum that shows specialized films in the field of carpet weaving and designing kilim motifs. Library of museum contains 7000 books, which are available to researchers and those interested in art. It should be mentioned that there is a collection of the most precious books, publications and pieces of research about Persian Carpet in library, which is very valuable. In order to preserve the art of kilim and rug weaving, the museum has founded a number of classes to teach carpet weaving, design of carpet motifs and repair and darning of the damaged rug and kilims. At the end of these courses, a valid certificate is awarded to students. There is also a public repair shop that repairs people's precious carpets. This shop is founded by the demand of collectors and owners of valuable carpets. There is a tea-shop at the corner of the building of museum, which reminds the old and traditional Iranian coffee-shops and receives the guests and people, who are interested in art and old Iranian traditions.